We gave 37 chanichim (campers) the best time at camp this week. What happened next will shock you. It all started Monday night. We broke up into our tzrifim (bunks): The girls were in omanut (our art center) for a DIY night where they made fun arts and solid crafts, and the boys went out onto the agam (lake) at sunset and did some boundary breakers, where they answered questions about their lives and shared personal stories. Tuesday morning brought the normal kitah (class), schiya (swim), and chug (elective) rotation that we all know and love. An afternoon of sports was balanced with an evening of erev (evening) Casino. Just like in an actual casino, our chanichim felt like they were unhinged from time because of the enjoyment they were having. But to be fair, Yavneh is a lot less smoky than a casino, and the clientele are a lot younger. In fact, I haven’t seen anyone above the age of 14 in our aydah (age group). Either way, it was really good. 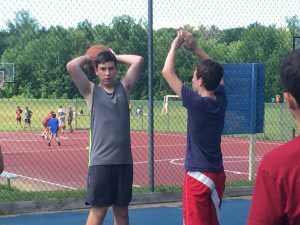 Wednesday: aka, the day we played kickball, and started our chesed project (charity project, something every aydah at Yavneh does over the summer). We started scraping a fence, and soon we will paint it- more details on this later! Meanwhile, the girls have been working on daglanut (a flag dance for yom Yisrael (Israel day), a tradition for Levi’im girls to do). Yesterday was a great achla yom (literally awesome day, when we have our alternative schedule) at Wallis Sands, a great New Hampshire beach. Grains of joy (and sand) came back with us on the bus after a fun day of swimming, ice cream (THE KIDDIE SIZE WAS LIKE 3 SCOOPS), and all around happiness. If our chanichi m‘s lives were a movie, the scenes at camp would be those grainy flashback nostalgia scenes that look like they’re using old film: defining and brimming with happiness, but also seemingly from another time and tinged with the sadness of their passing. 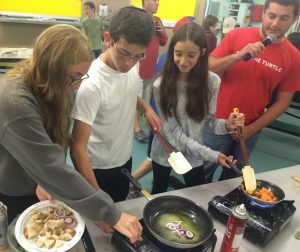 And after our Top Chef activity last night, where the campers made an appetizer, main course, and dessert with some given ingredients, there is no doubt that our chanichim are really having moments that they can look back on with a smile for the rest of their lives.